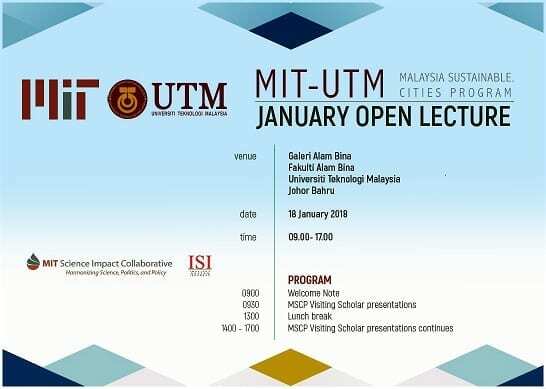 Launched in September 2013, the MIT-UTM Sustainable Cities Program (MSCP) is a five-year effort supported by the Malaysian government. It is aimed at improving the quality of instructional materials available to college and university faculty around the world that teach about sustainable city development. In practice, the program will conduct a Practicum study tour every January for the period of 2014 – 2018. Practicum have formulated questions that a researcher working on their own for four to five months could successfully address. The Practicum also emphasized questions likely to produce “actionable findings” relevant across the developing world. While another effort Open Lecture is actually merely similar to Practicum itinerary where there have those scholars presenting their research (talk series) to student during Practicum’s first week. 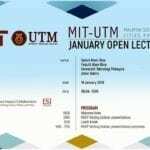 Instead of two weeks, this Open Lecture only take one day event within UTMJB.